Our mind may well be our biggest weapon – but it means nothing if we don’t know how to use it effectively. As a result, in a majority of cases most of its potential remains untapped and underutilized. Wouldn’t it be great if each one of us could use our mind to its fullest potential? Imagine the work we could get done and the great feats we could accomplish. Would you be surprised to know that we can in fact use our minds much more effectively – then we are doing currently? This can be done, by reading the many engaging books on m human psychology written by several noted experts from the field. Experts who have dedicated their lives to making sense of how our minds work and how we can use it to its optimum potential to improve our life and chances at success. Read on to discover 10 of the most amazing books that probe the mysteries of the human mind (and also enjoy a high rating on Amazon) and share ways to use it to turn our life around. With this book Peterson, a world renowned psychologist attempts to examine a range of questions centered round people and their choices. Like for example, the paths they choose on becoming vindictive or arrogant and why it’s a good idea to pet a stray cat on the road. Peterson draws from his own considerable experience and uses modern scientific techniques to cut through the jargon of conventional wisdom. He succeeds in narrowing it down to a set of just 12 basic yet practical rules for life – using a humorous and informative approach. Many of them are contrary to popular wisdom and break societal stereotypes, while still giving the reader a sense of new direction, fulfillment and transforming his innate sense of faith. Amazon Rating: 4.7 out of 5 Stars. 2. The Power of Habit: Why We Do What We Do in Life and Business – By Charles Duhigg. Authored by award-winning New York Times business reporter Charles Duhigg, this book takes a long, hard look at how our habits have the power to shape our life and career. Duhigg makes a strong case using several famous examples like that of Michael Phelps Jr – the champion American swimmer and winner of 23 Olympic gold medals, civil-rights champion Martin Luther King and the CEO of Starbucks, Howard Schultz – who reached the pinnacle of success simply by adopting the right habits. The book also cites examples of successful companies like Proctor and Gamble, Target stores, the NFL and leading hospital chains which followed a similar path to make millions in profits, after a prolonged period of struggle. At its core, the book displays a deep understanding of human nature and their potential for self-transformation – making it a must-read for people who want to transform their life and career. As one of the world’s leading experts on behavioral psychology and happiness studies, Nobel Prize winner Daniel Kahneman needs no introduction. And courtesy this book authored by him, we finally get an engaging and insightful glimpse into his life’s work. Thinking, Fast and Slow has the potential to change the way we think and how we choose. Kahneman expertly shows the reader how the mind works, when we can trust our intuitions and lists the many benefits of slow thinking vis-à-vis the pitfalls of cruising in the fast lane of thought. Last but not the least, the book presents a delightful preview of how our mind can influence our choices in both our personal and professional lives and details what are the safeguards available to us to prevent this from happening to often. Are the rising incidents of violence, depression and unprovoked anger on American campuses a direct result of the new safety culture rampant on US varsities? Has the loss of unsupervised playtime, the rise of social media and political uncertainty played a role in spreading conflict and confusion on campuses today? These are just some of the key raised by the authors’ social psychologist Jonathan Haidt and First Amendment expert Greg Lukianoff. Their book is a deep-rooted examination of raging campus issues that are threatening the very foundation of free speech, education, mental wellbeing and democracy in the US. The result according to the authors has been an unprecedented rise in the number of cases of depression and anxiety among young adults caught on the wrong foot. The book also offers a range of solutions to fix this issue making it a balanced read for people interested in knowing what ails campuses in the US today. How would you react if you knew that humans have supernatural abilities? Like the power to tune into frequencies from beyond this world and that we can purposefully recalibrate our brain chemistry to experience mystical occurrences. Regardless of whether you believe it or not, Dr. Joe Dispenza, the author of this book is convinced we can. And his faith is centered around his research on how common people can do uncommon things – a topic he has been researching on at his advanced workshop since 2012. With this book, the celebrated author of best-sellers like You Are the Placebo, Breaking the Habit of Being Yourself and Evolve Your Brain, combines the best of new information based on scientific facts with ancient wisdom to convince people like you and me that we can, in fact, lead a more supernatural life and gain access to spiritual realms if we live a meaningful life. Amazon Rating: 4.8 out of 5 Stars. If you thought that the secret to success in any field lies in having the talent, well, you could be wrong according to psychologist Angela Duckworth. In her book, she explains why talent has little to do with ensuring success and it’s this often under-rated quality called – grit – or sheer persistence that plays a bigger role. Drawing from her own experiences chasing different careers like teaching, business consulting and neuroscience, Duckworth elucidates eloquently on the hypothesis behind her arguments and shares many examples of how she tested her theory as a professor at the University of Pennsylvania. The book makes for a compelling read regardless of whether you’re a student, businessman, salesman or housewife. Delightfully personalized, in depth and inspiring, Grit is essentially a book about what goes on in your head when you fail and its grit (not talent) that forces you to get back up again. 7. 48 Laws of Power (Audible Audiobook-Unabridged) – By Robert Greene (Author), Richard Poe (Narrator). Known for his books which often revolve around strategy, power and seduction, celebrated American author Robert Greene’s 48 Laws of Power has often been described as a ‘amoral, cunning, ruthless and instructive’ work of literature. The book painstakingly separates over 3,000 years of the history of power into 48, well-defined laws of power, stripped of all the usual bells and whistles. It makes for a fascinating listen for anyone interested in hearing the essence of great strategists like Sun Tzu, Machiavelli and Clausewitz whose teaching and strategies form the basis for the 48 laws shared in this volume. 8. Braving the Wilderness: The Quest for True Belonging and the Courage to Stand Alone – By Brené Brown (Author, Narrator). This audio book which has already featured as the No. 1 best-seller on the New York Times list redefines what it means to truly belong in rapidly changing world. Liberally strewn with the trademark style, humor and honesty of its author Brene Brown, PhD, it argues about what she terms as a – spiritual crisis of disconnection. According to Browne, it’s easier to stay quiet at a time when civility has taken a backseat as opposed to revealing the truth and bracing for the criticism that is sure to follow. But by doing so we are straying away from true belonging – which comes from within and demands integrity. With this book, Brown offers readers the courage and clarity they desperately need to find their way back into the light, but warns it passes through an ‘untamed wilderness’ which she describes as a sacred place. 9. Outliers: The Story of Success (Audible Audiobook – Unabridged) – By Malcolm Gladwell. Stunning and entertaining – is the only apt way to describe this book written by Malcolm Gladwell that takes the reader on a fascinating journey through the world of ‘outliers’ – a term he uses to describe high achievers. He also questions our tendency to put them on a pedestal and asks why we lavish them with so much praise and attention. The book reiterates that we need to start paying less attention to what successful people look like and do and more too where they come from – if we ever hope to replicate their success someday. And taking a slight detour, Gladwell dwells on some other interesting topics as well like why he thinks The Beatles is the greatest rock band ever and why Asians are so damn good at math. Amazon Rating; 4.6 out of 5 Stars. 10. Maps of Meaning (Audible Audiobook – Unabridged) – By Jordan B. Peterson. This provocative hypotheses authored by Jordan Peterson, combines the best theories of cognitive science, neuropsychology with the Freudian approach to mythology. The end result is a rich theory which enables reader’s access to the meaning and essence of ancient myths – providing a new mental challenge to a modern mind. It’s a brilliantly-narrated book from the author of 12 Rules for Life: An Antidote to Chaos, Peterson that explores the plausible reasons behind why most of the myths from different cultures have an identical structure and how this has impacted the modern world that we all live in. Our mind is one of our greatest assets, yet, for some people, it’s a constant source of anguish. It doesn’t have to be this way – even if you’re always losing the house keys or not living upto your full potential for any reason. 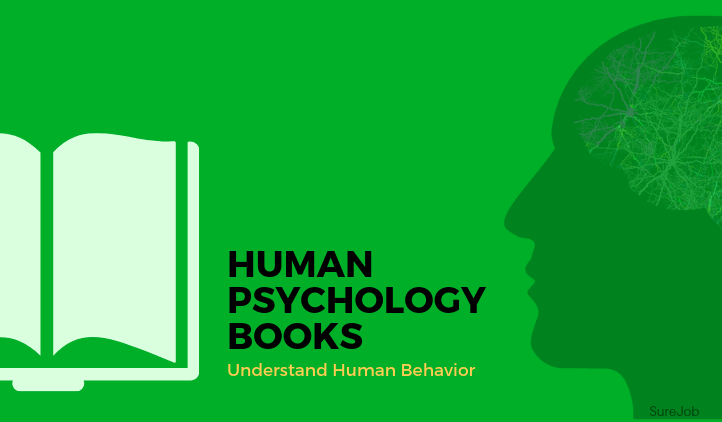 By reading some of the books on Human Psychology mentioned in this article – which delve deep into the mechanics of the mind – you too can overcome your mental anxieties and chart your own course to a successful life and career. Next articleHow to Find All Old NCERT Books Online? All the books are very helpful .